Building on-premises servers can be a daunting, and complicated, process for a small business or enterprise branches. Makkeen Branch makes it simple. 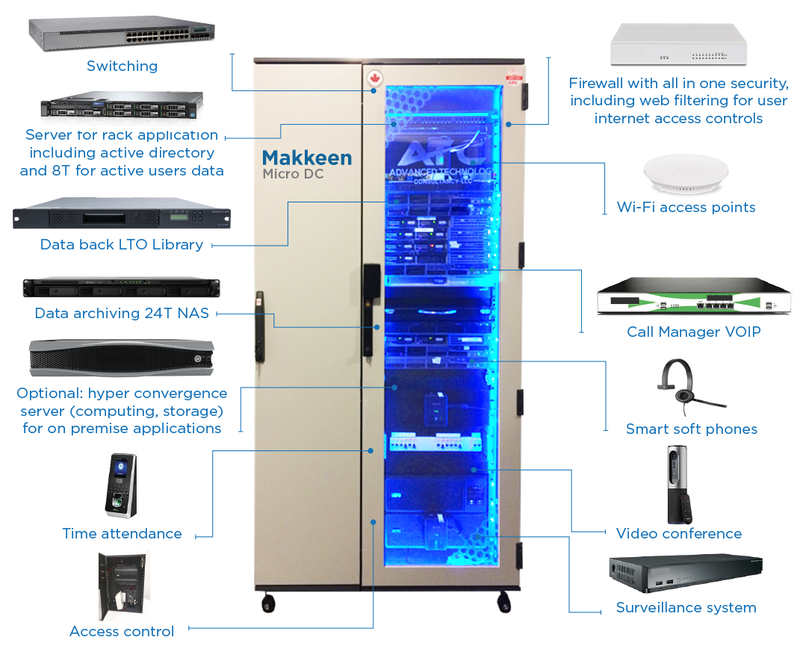 Built on top of the Makkeen MicroDC self-contained rack, Makeen Branch is delivered pre-configured, containing all of the necessary hardware technology infrastructure [Technology-in-a-box] a small business needs. Featuring firewalls with all in one security, switching, call manager, VOIP smart soft phones, video conferencing, access control, time attendance, surveillance system, computing, storage, and backup, Makkeen Branch offers reduced costs and increased operational efficiency. Makkeen Branch is available with an optimized hardware configuration which can be customized for larger orders of five or more branches. A hyper converged server, encompassing computing and storage, is available as an option. All-in-one security firewall/router, including web filtering, apps control, Data Leakage Protection [DLP], and Multisite /Branch secured NPN/MPLS connectivity enablement. Switching and Wireless Office access point with single SSID. Server licensed and virtualized under Microsoft Hyper-V to host AD or AAD, self contained Rack applications, 8 Terra SSD storage and LTO Backup Solution. On premise archiving NAS storage. Physical access control and time attendance solution, to manage accessibility into the branch. Video surveillance system, security motion detection cameras to record and save motion around office space. Integrated VOIP solution and virtualized Skype for business call manager with Telephony gateway, allowing employees to communicate via soft phones installed on their desktops or mobiles or Conferencing station. Hyper-convergence technology to host your on premise business applications. Conferencing meeting rooms preparation, supply of shared office equipment, end user stations or laptops, station image creation and deployment, and related services and proactive preventive maintenance. Managed services [ITIL/ISO 20000] and IT Security [ISO/IEC 27001-2005] standard to provide installation, configuration, yearly renewable support, with A service level agreement covering L1 (service desk, online support), L2 (administration and monitory), and L3 (change management, vendor escalation).